Can This Insurer Continue to Rise Above Its 52-Week High? Assured Guaranty has ridden the waves of good news to a new yearly high. Will this continue with earnings looming next week? Shares of Assured Guaranty (NYSE:AGO) continue to go up in advance of earnings next week, hitting a new 52-week high on Tuesday. Let's take a look how it got here and if it can potentially go even higher. The monoline insurer's dramatic rise began in earnest with a victory in court against Flagstar Bancorp (NYSE:FBC) earlier this month. In the case, Assured alleged that that Flagstar had stuffed defective mortgages into securities they were asked to guarantee. Judge Jed Rakoff ruled in favor of Assured and ordered that Flagstar pay Assured $90.1 million plus attorney fees and other costs . Assured is set to release fourth-quarter earnings next Wednesday , so investors will be able to get a better handle on how the insurer will perform going forward. Analysts are expecting $0.70 EPS for the quarter, and $2.50 EPS for the entirety of 2012, which would both mark a decline from 2011. Assured's performance will go a long way to determining if the company will remain perched at its lofty heights, and if investors will continue to reap those rewards. One thing investors can look forward to is a higher dividend, with Assured announcing an 11% increase to its quarterly dividend shortly after winning its court battle with Flagstar, pushing its yield to nearly 2%. Municipal Bonds: The Best Income Investment of 2014? Can Assured Guaranty Top Genworth Financial and Radian Group? 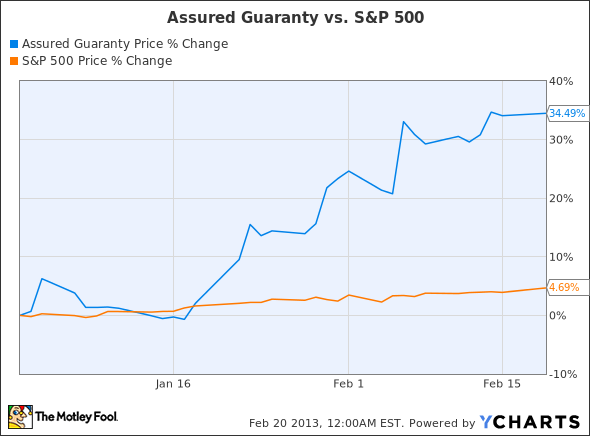 Will Detroit Crush Assured Guaranty Earnings?